Pumpkins are not meant for Halloween only. They can be used to prepare many different pumpkin bread recipe. 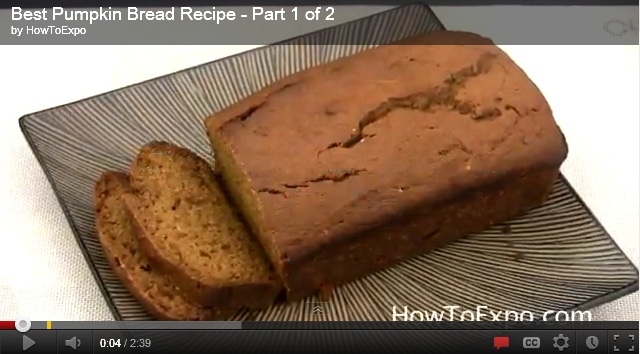 Here is a simple pumpkin bread recipe with canned pumpkin that everybody in your family will love. – Preheat the oven to 350F. – Peel and mash the bananas. – Grease and flour a 9×3 inch bread loaf pan. – Beat the eggs till fluffy. – Add the mashed bananas and canned pumpkin to the eggs and blend well. You will get a gooey kind of mixture. – Add the oil and sugar to the mix and blend well. Use an electric mixer on low speed. – In a separate bowl, whisk the flour, baking powder, baking soda, ginger, cinnamon, nutmeg, oats and salt together. – Add this dry mix to the pumpkin mix until just mixed. You will get an even moist mix. – Pour the batter in the greased bread pan. – Bake in the preheated oven at 350F for about 1 hour. – Remove from the oven and cool before cutting in slices to serve. Though you can serve this bread as it is with hot cocoa and enjoy as an evening snack, you can also serve it with a spicy caramel apple sauce. – In a small saucepan, combine the cream, apple juice, star anise, ginger, cloves, cinnamon and grated fresh nutmeg and bring it to simmer. – Remove from heat and let the mix steep for about 30 minutes. Strain and set aside. – In a separate pan, take the sugar, water and apple cider vinegar and simmer for 8 minutes on low heat. Don’t stir the mix. Remove from the heat once the mix turns a deep amber color. – Remove from heat and slowly stir in the cream mix until well mixed. – Add the apple schnapps to the mix. – Heat for another 30-40 seconds and remove from heat. – Keep in a serving bowl and serve warm with the bread. – You can also make this 2 days in advance and warm before serving. Rice flour is very popular in southern parts of India and is used to prepare many tasty dishes. Here is one popular rice flour bread recipe from Karnataka that takes only minutes to prepare and is full of taste and flavors. This bread recipe is served with dill-coconut chutney and eaten hot off the griddle. – In a bowl, mix the rice flour, chopped onions, green chili, coriander leaves, salt and cumin seeds. – Sift the ingredients together. – Add the grated coconut and mix well. – Now add a little water to the flour mix to get a smooth dough. The dough should not be too firm or too soft, just firm enough to hold in your hands. – Divide the dough in 3-4 equal parts and make balls. – Spread some oil on a flat griddle and heat it at low flame. – Place one ball of dough in the middle of the griddle and use your fingers to spread it to 1/2 inch thick round. Wet your fingers in between to prevent the dough from sticking to your fingers. – Make some tiny holes in the round bread and pour a few drops of oil in the holes. – Cover the bread and let it cook for 4-5 minutes on low flame. – Remove the cover and flip the bread and cook for 2 minutes. – Remove from heat and serve with tasty dill-coconut chutney (recipe given below). – Grind all the ingredients in a mixer jar or food processor till you get a smooth paste. – Add a little water to get even grinding. – You can make this chutney and store for up to a week in the refrigerator. – Serve this chutney with the Akki roti. – You can also serve the rice flour bread with different curries. – Don’t forget to serve a dollop of fresh butter on the side. – You can increase and decrease the amount of coconut used in the dough depending on your taste. Using fresh coconut makes the roti soft. The very popular bread does not have to just be simple white bread or whole wheat bread; you can add many delicious ingredients to the bread and turn it into a nutritious pumpkin bread recipe that will delight your whole family. Given below is a tasty cranberry and pumpkin bread recipe healthy and easy to prepare. – The recipe makes 2 loaves of bread. – Grease and flour two 9×5 inch bread loaf pans. – In a mixing bowl, beat the eggs and egg whites together to make them fluffy. – Add the yogurt and applesauce to the mix and whisk well. – In a separate bowl, mix the all-purpose flour, whole wheat flour, sugar, baking soda, baking powder, cinnamon, ginger, brown sugar, salt and ground cornmeal. Break any lumps in the brown sugar with your fingers. – Add this flour mixture to the egg mix, 1/2 cup at a time. – Blend well to avoid any lumps of flour in the mix. – Pour in the pumpkin puree and mix some more. – Add the dried cranberries in last and give the batter one last stir. – Pour the batter in the two greased pans. – Bake in the oven at 350F for 55-60 minutes until a skewer inserted in the middle comes out clean. – Remove from the oven and cool for five minutes. – Turn the bread out from the pan and cool completely before cutting in slices to serve. While the pumpkin bread is good to be eaten as it is, it makes a perfect lunchroom snack. – Beat the butterscotch sauce with the sugar until it reaches a smooth and spreading consistency. – Spread some frosting on the bread and enjoy! You can double wrap this bread and store in the freezer for later use. – This topping has to be baked on top of the bread. – In a bowl, mix all the ingredients together to get a crumbly mixture. – Sprinkle this mixture on the bread batter in the pan and bake the bread as instructed above. – Spread the bread cubes on a baking sheet and bake in the oven for about 7 minutes, until they are dry. Keep turning in between. – In a deep bowl, whisk the eggs, sugar, vanilla extract and 1/8 teaspoon of salt until the sugar starts to dissolves. Use the eggs at room temperature. – In a saucepan, mix the cream and half and half and bring to boil. Simmer for 2 minutes. – Slowly whisk the egg mixture in the cream mix and combine well. – Strain the hot mix through a sieve and set the custard aside to cool to lukewarm. – Slice the bananas in half lengthwise and then cut crosswise into thin pieces. – In a thick bottomed saucepan, take the dark brown sugar, butter and 1/4 teaspoon of salt. Stir over low heat to get a uniform sauce. Add the lemon juice and toss the banana slices in the sauce for about 30 seconds until well coated. – Remove from heat and cool. – Grease an 8x8x2 inch baking dish and scatter about 1/3 of the toasted bread cubes at the bottom. – Top with 1/2 of the sliced bananas and some of the syrup. – Pour 1/2 of the custard over the bananas. – Scatter 1/3 of the bread cubes over this. – Add another layer of banana, syrup and 1/2 of the remaining custard. – Scatter the remaining bread cubes and the rest of the custard. – Let the pudding stand for about 30 minutes to let the bread soak in the custard. – Place the pudding dish in a large and deep metal baking pan and fill the metal pan with water half way up. – Cover the pudding with aluminum foil. – Bake in the preheated oven at 350F for about 30 minutes. – Remove the cover and bake for another 45 minutes to let the custard set. – Remove the pudding from the water bath. – Set aside for 15 minutes and the tasty bread pudding is ready to serve. Rye contains a higher amount of fiber than other flours and is often used in place of wheat and refined flour. Since it has only small amounts of fat, it does not cause high spikes in blood sugar. Rye bread machine recipes are easy to make and denser than wheat bread. 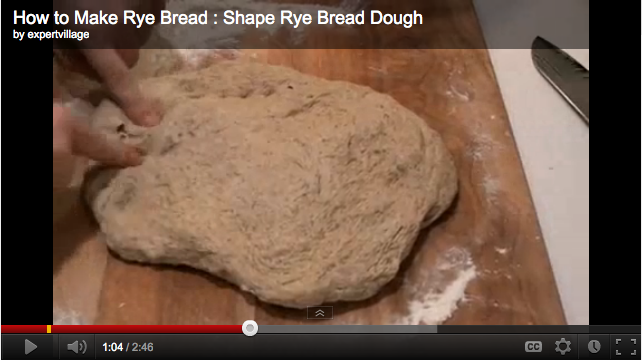 You can easily make this rye bread recipe bread machine by following the given recipe. – Read the instruction booklet that came with your bread machine thoroughly before adding ingredients. – Clean out the bread pan and dry it. – Pour the water in the bread pan. – Add the salt, vinegar and canola oil. – Gently add the bread flour, rye flour, caraway seeds, cocoa powder, dried onion flakes and vital wheat gluten. – Sprinkle the dried yeast in last. Do not mix the ingredients by hand otherwise the yeast will start rising and your bread will spoil. – Close the lid of the bread pan. – Set the machine on the white bread cycle for a 2 pound loaf and let it run the full cycle. – Once the time is up, remove the bread from the pan and cool on a wire rack before cutting in slices. – Do not use cold liquids. All liquids should be at room temperature. – Always use fresh bread machine yeast. – Pouring in the liquids first prevents them from spattering on the sides. – The bread can be stored in the refrigerator for days. – Serve with warm butter or you can cut it in thin slices to use for sandwiches. – This bread makes a great snack too. You can cut it in fingers and toast to serve with a dip. – Cut the rye bread in cubes. – Crush the garlic clove. – In a saucepan, heat the olive oil and add the bread cubes and garlic to it. – Sauté for a few minutes until the bread is brown on both sides. – Remove from the heat and remove the garlic. – Heat the bread in the oven at 350F for 5 minutes. – Serve with salads and soups. Gluten free food and bakery items are the call of the day and more and more people are turning towards them as a healthy alternative. 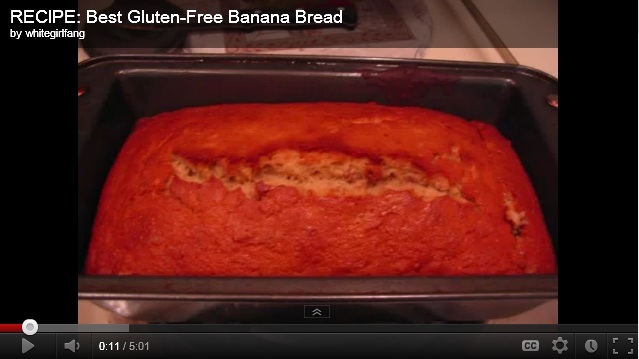 Banana bread recipe is on delicious and nutritious alternative. If you have been wondering where to get the best gluten free banana bread recipe then your search stops here. – Mash the bananas using a fork. – Add the butter and sugar to the bananas and use an electric blender to blend them together. – Add the eggs and mix well. – Sift the rice flour, buckwheat flour, baking powder and salt in a bowl. – Add the flour mix to the banana mix and mix well to avoid any lumps. – Pour the batter in a greased large loaf pan and bake at 350F for about 1 hour 15 minutes until the cake is firm. – Let the cake cool for about 10 minutes. – Mix the icing sugar with the lemon juice and drizzle it over the warm banana bread. – Cool the bread and cut in slices to serve. – You can store the bread for several days. – In place of wheat flour and buckwheat flour you can use 2 cups of rice flour. – If you don’t have gluten free icing sugar then you can use regular sugar in place of it. – Replace sugar with honey or maple syrup. – You can also use lemon syrup in place of the lemon juice and sugar mix. – Boil the lemon juice, sugar and lemon zest on medium flame. – Let the mix simmer for 5 minutes. – Remove and set aside. – When the bread is done poke some small holes on the top of the bread. You can use a skewer or a toothpick for this. – Remove the lemon zest from the syrup. – Pour the syrup on top of the bread loaf. – Poking holes in the bread allows the syrup to penetrate deep in the bread. – Let the bread sit in the fridge overnight before serving. This will give it a more powerful flavor. – You can increase or decrease the amount of lemon juice depending on your taste. You can make this recipe completely vegan by replacing the eggs with bananas and using vegan margarine in place of butter.